B Naturo, an agricultural research scientist company has started an organic super market in Mylapore near Sai Baba temple. 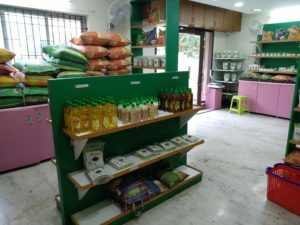 The store has a wide range of organic rice, groceries, millet and oil. B Naturo USP is that it sells ‘Certified’ Organic products. They cater to in and around 5 Kms radius of Mylapore. “Our prices are at a reasonable premium over conventional foodstuff. We are now supplying around 650 families and adding more organic consumers every day and striving to reach high”, says Geetha V, store manager. B Naturo has developed organic products, with the most innovative bacteria-culture/ bio dynamic technology. “We have recently started selling organic soaps and cosmetic products. All our products come unequivocally at rates similar to the current market rates”. The store boasts of 100+ organic products and provides free door delivery. Located at 1, Alamelumangapuram, Mylapore. Ph: 7358321606 / 787117670. Timings: 9.30 a.m. to 9 p.m. This entry was posted on Sunday, February 10th, 2019 and is filed under Lifestyle, Stores, Restaurants, Food fest, Stores, Sales, Shopping. You can follow any responses to this entry through the RSS 2.0 feed. You can skip to the end and leave a response. Pinging is currently not allowed.